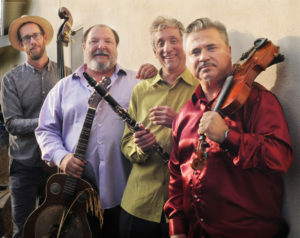 Formed in 2009 in Santa Barbara, California, Kalinka plays a rich mix of music including Jewish klezmer, Balkan music, gypsy swing, Roma music, and Middle Eastern melodies. Their acoustic sound is joyous, sweet, and gutsy. They have played at the Skirball Cultural Center, the Santa Barbara Jewish Festival, the University of California Santa Barbara’s Noon World Music Series, Live Oak Music Festival, Westmont College, Ojai Earth Day, The Fiddlers Festival in Goleta, and the Topanga Canyon Banjo and Fiddle Festival. They have also played at many weddings, bar mitzvahs, and private events. Fred is one of Kalinka’s original members, is an author and historian, a student of Klezmer music, a member of the UCSB Middle East Ensemble, and an aficionado of Turkish, Greek, and Romani clarinet players. Eric has a Ph.D. in Ethnomusicology from UCSB; he is an expert on Turkish improvised music. In addition to guitar he plays oud and traditional stringed Turkish instruments, and performs with the UCSB Middle Eastern Ensemble. Daniel is completing his undergraduate degree at UCSB, is lead violinist with the UCSB Middle Eastern Ensemble and a marvel to listen to. Andrew is a professor of Education at the Gevirtz School at UCSB, has played bass with local favorites such as Oso, before joining Kalinka three years ago.